Forgiving is about seeing the Light in someone else. We’re all a part of our creator; we all come from the same place. We’re all connected. You don’t have to believe in a God to understand this. We’re all Light. The problem is, many of us don’t see that or know it or believe it. Even as you read this, do you know it’s True? The Light is within you. The Light is within everyone, and it all comes from the same source. You might think of Light as Love instead, and the concept still holds true. We’re all Love, whether we know it or not, it holds True. What happens when we don’t know that we are Light is we don’t behave in a place of Love and Light. Too many times we remain in darkness. Forgiving another is recognizing the Light within the other. This person may not recognize the Light within herself. If that’s the case, then she also won’t recognize the Light within you. This is okay. Your only job is to see beyond the darkness and beyond the deeds and see the Light within. Even if it’s only dimly lit, it’s there. And that Light is the part in all of us that belongs to the same entity, that makes up one Universal Light. 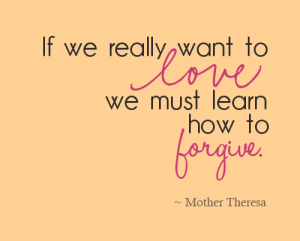 When you forgive another, you’re forgiving yourself because, no matter who that person is, you’re connected to her. Sometimes we’re wronged so deeply that to forgive seems almost irresponsible at first glance. Here’s an example. I work with a woman who was so brutally abused by her husband for years that she lost all sense of self. Finally she’s beginning to write about these experiences. Through writing, she’s beginning to heal. In her situation much forgiveness has to take place. She is choosing to work through that process. She’s out of the situation in her life, but she’s not out of the situation in her heart, in her soul, or in her mind. In those places the pain resides, and once she fully forgives, that pain will be lifted. There will be peace. In order to forgive this man, she has to recognize the Light within him. She need never see him in the physical world again to do this. She need not tell him about it. It’s not as though once she sees that Light she should then remain in the relationship. We don’t condone actions; we forgive souls. She’ll have to decide whether to stay or go. That isn’t involved in the forgiveness. The forgiveness simply acknowledges I see the Light within you. I acknowledge the Light within you. Once this happens, you’ve forgiven. Once you’ve forgiven, you reclaim your power. Once you reclaim your power you have the power to choose. The reclaimed power is what allows you to say This situation no longer serves my Highest good, and, therefore, I will not revisit it. The power allows you to Love yourself and to move forward. When you Love yourself wholly you will know nothing can hurt you, and then the fear will vanish from your Life. Sound easy? It’s not. But it’s worth taking the first steps. Writing about it is always a good first step. But you will know what’s right for you. Whatever it is, Choose Miracles.